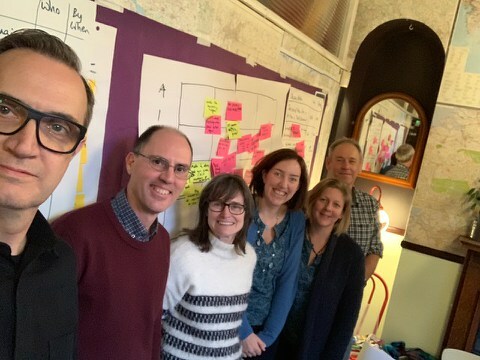 April 2019 update: Join our monthly facilitation networking & learning meetups, now throughout England & Wales and online! Welcome to IAF England & Wales. We are around 85 IAF members including 16 Certified Professional Facilitators (CPFs), spread throughout England & Wales and beyond. 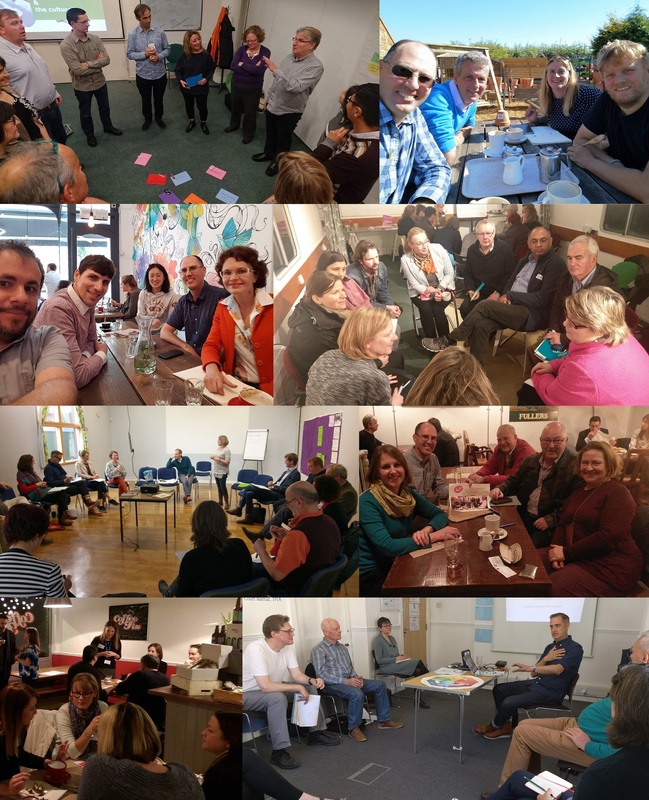 London & South East - over 550 IAF facilitators & friends, with monthly morning coffee meetups in Cambridge London, Oxfordshire & Winchester plus each month in London either an afternoon or an evening learning meetup or an evening drinks meetup. We are keen to support new monthly coffee meetups in Brighton in particular. North of England - over 135 IAF facilitators & friends, with monthly coffee meetups in Leeds, Manchester & Newcastle and three afternoon regional learning meetups per year. We are keen to support a new monthly coffee meetup in Liverpool in particular. South West of England - over 135 IAF facilitators & friends, with monthly coffee meetups in Bristol and three afternoon regional learning meetups per year. We are keen to support a new monthly coffee meetup in Devon in particular. 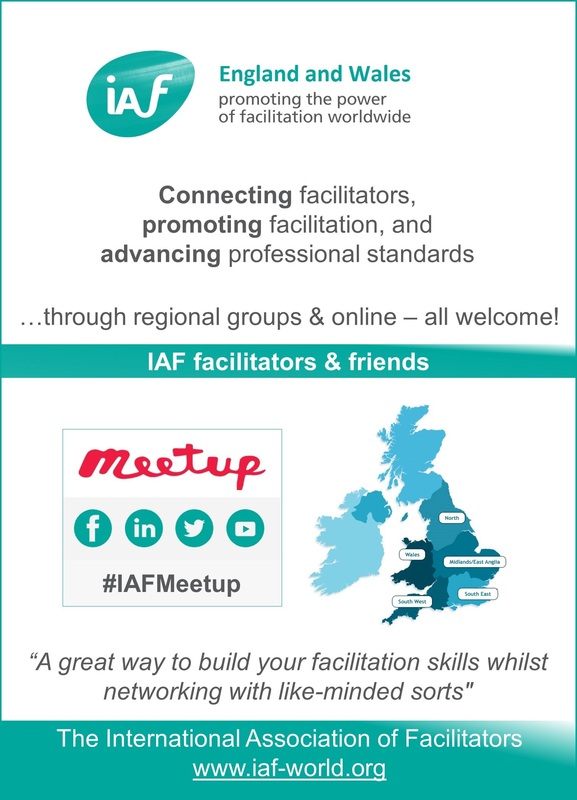 Midlands & East of England - over 65 IAF facilitators & friends, with monthly coffee meetups in Birmingham plus two afternoon regional learning meetups per year and our England & Wales Annual Conference in Birmingham during International Faciliation Week each October. We are keen to support a new monthly coffee meetup in Nottingham in particular. Wales - new for 2019 and over 35 IAF facilitators & friends already, with monthly coffee meetups in Cardiff and North Wales. We are keen to support afternoon regional learning meetups in particular. Members of all five regional groups come together online for a monthly virtual coffee meetup as well. We also work to schedule a Certified Professional Facilitator assessment in the UK each year. Group members are encouraged to use the meetup groups to convene additional ad hoc & imprompt meetups wherever & whenever suits them, according to their own interests. Please join us at a meetup by clicking on the meetup group links above - everyone with an interest in group process facilitation is welcome, including facilitators and others who use or commission facilitation, IAF members and non-members alike. Please connect with us online also, by joining over 900 IAF facilitators & friends in our Facebook and LinkedIn groups, and by following IAF England & Wales on Twitter and Instagram. Please also take a few minutes to complete our online survey, to help to make IAF England & Wales and our free facilitation meetups more valuable to you in the coming year - thank you! Click on the image below to enlarge it, and please follow the links to our regional meetup groups above for further details and to RSVP to an #IAFMeetup near you! Coffee meetup hosts for Brighton, Devon, Leeds, Liverpool, London & Nottingham - or wherever you are! Or, please let us know how you would like to get more involved! For further information, download our IAF E&W Leadership Team 2019 plan, the invitation to Stand for election to the IAF England & Wales Board in 2018 and the IAF England & Wales Chapter Bylaws.